As kids we all loved figgy biscuits. These little pillows of fig paste encased in a delicious cakey-biscuity dough were invented in Philadelphia in the late 1800s and are sold in the USA under the Newton brand. In England we bought a version made by McVities. Anything home-made always tastes better than the shop-bought variety and these scrumptious biscuits are no exception. Buy dried figs which are plump and sticky and not too hard. 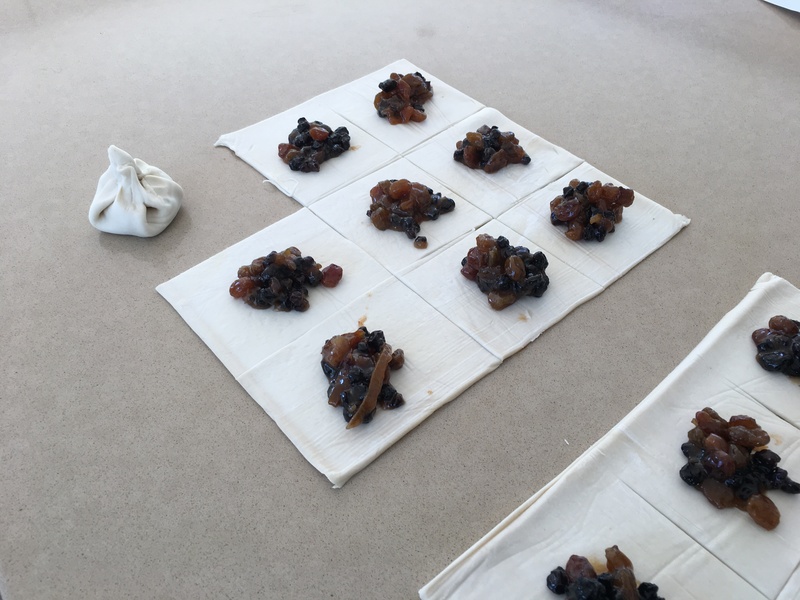 If you don’t have quite enough throw in a few sultanas, raisins or dates to make up the two cups. The addition of ginger is my own suggestion for ginger fans. This is a good recipe for using up that last bit of jam or marmalade from the bottom of the jar. Commercial figgy biscuits don’t have a sprinkling of icing sugar, but I always think it enhances the appearance of baked goods. Mine were a bit overcooked, as you can see in the photo. They should have been whipped out of the oven a few minutes earlier. Serve as a biscuit or warm with vanilla ice-cream as a delicious dessert. Place butter, brown sugar, bicarbonate of soda, salt, cinnamon and honey in food processor. Process for a minute or two, stopping to scrape down the sides and gradually adding the orange, egg and flour. When thorough mixed use a spatula to scrape the dough onto a piece of plastic wrap. Pat it into a thick square, wrap with the plastic, then refrigerate for an hour or so. There’s no need to wash the food processor before you make the filling. Place all ingredients in food processor and process till smooth, stopping to scrape down the sides. Preheat oven to 170°C. 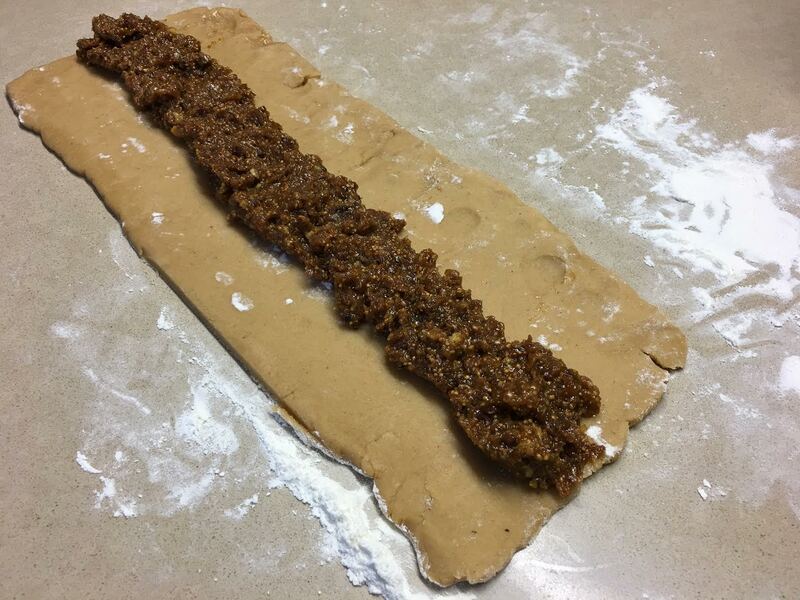 Cut dough in half and roll out one half on a floured surface to a rectangle approximately 30cm by 10cm. Spread half the filling thickly down the middle as shown in photo. Bring in one side over the filling, then the other side, overlapping with the first side. You may need to use a metal spatula to lift the dough which will be quite soft with a tendency to stick and break. You will then have a long sausage with a seam along the top as shown in the photo. Turn it over and cut into 8 to 10 even pillows. Arrange on a shallow baking tray lined with baking paper, with a space between each biscuit. Repeat with the other half of the dough and filling. Brush with beaten egg white then bake for 15 mins or until light golden brown. Cool biscuits then store in an airtight tin. My mother’s best friend Edna was affectionately known as Little Edna because she was so tiny. She loved to bake and watching friends and family eat what she had made gave her a great deal of pleasure. You rarely saw Little Edna eat anything herself, which is one of the reasons she was so tiny. My mother was always trying to shed a few kilos so we would avoid calling in at afternoon tea time. This wasn’t easy, as time-wise afternoon tea was a movable feast. Any time visitors popped in was an excuse to put the kettle on and get the cakes out. Edna was what is known as a “feeder” and saying no thank you wasn’t an option. Edna and Stan kept a caravan on one of the beaches in northern France. They went there for a month each summer, often taking their grandchildren with them. One year Edna was on the beach, holding hands with two of her grandchildren as they ran in and out of the waves, laughing and splashing. Suddenly Edna’s false teeth shot out and into the sea. Despite a long search, they were nowhere to be found. Driving back to England to get a new set wasn’t an option – they had only just arrived. So poor Edna spent a miserable two weeks feeling embarrassed and avoiding conversation. One day as she was strolling along the beach feeling glum she looked down and lo and behold “There they were, laffing up at me” she explained, with her broad Yorkshire accent “so I picked them up and put them straight back in again”. 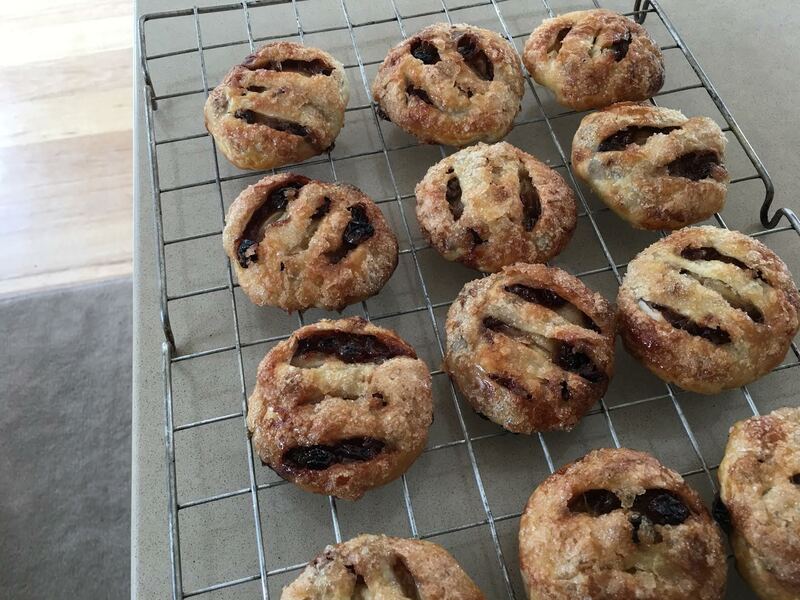 Eccles cakes are traditional British pastries named after the town of Eccles and they were one of Little Edna’s specialities. I always thought her method of cutting the pastry into squares rather than circles (which is quicker and avoids any off-cuts) but still ending up with round cakes was pretty neat. Preheat oven to 180°C. Cut each square of pastry into six even pieces – down the middle, then into three cross-wise. Mix filling ingredients and put a heaped teaspoonful or so in the middle of each square. Draw up the sides of each square into the middle and pinch the ends together firmly, to form a little round purse. Turn each one over and press firmly with the palm of your hand, so you have a neat round cake, or roll over each one lightly with a rolling pin. Cut two or three slashes with a sharp knife on the top of each cake. Brush each one with egg white, then dip in some sugar and shake off the excess. Arrange cakes on a baking sheet and bake for 15 minutes, or until golden brown. Serve warm or cold. Best eaten the same day. Note: if preferred, make the cakes smaller by cutting each sheet of pastry into 9 instead of 6 – as shown in this photo. Currants are dried small grapes not dried blackcurrants. If unavailable use more sultanas or some chopped raisins. 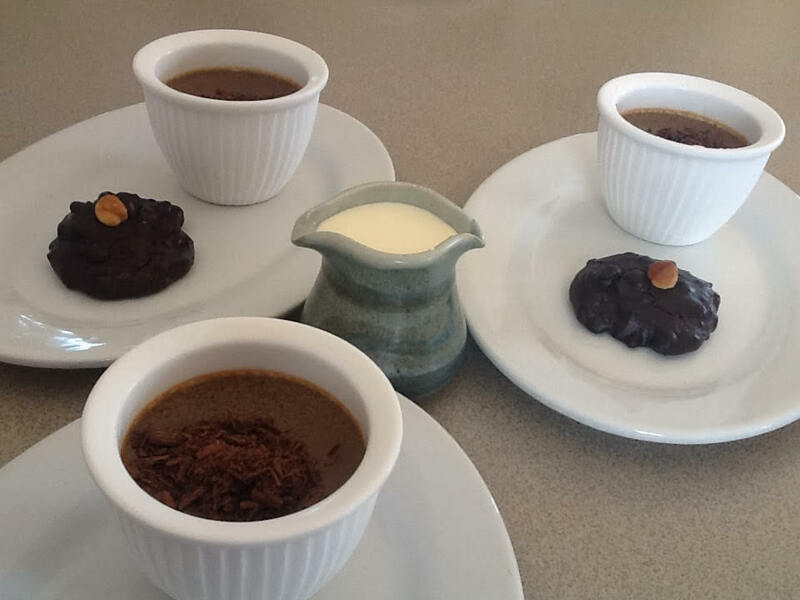 The recipe for these little coffee desserts was given to me by the wife of a British diplomat. By the time we met, Mary and her husband had had several postings, including one to a remote African country where entertaining was something of a challenge. Finding the ingredients for a Western-style dinner party and explaining to the local staff exactly what she wanted had not been easy for Mary. Sometimes things were simply lost in translation. Every time they entertained the food was inevitably served cold or at best lukewarm. Mary’s house boy Robert said that the cook was not to blame. The distance to the dining room was the problem. By the time the food had made that long journey along the hall from the kitchen, of course it was cold. Mary persuaded the Embassy to fund the installation of a serving hatch, so the food could be passed directly from the kitchen to the dining room and hopefully arrive on everyone’s plates before it got cold. In due course the hatch was installed. When the next dinner party was arranged Mary instructed Robert that from now on everything was to come through the new hatch. He seemed somewhat reluctant, but Mary said that it had cost a lot of money and her husband would be very cross if he didn’t use it. Robert was a likeable fellow in his twenties who tried hard to please. When the guests sat down the cold starters were already on the table. Mary sat with her back to the serving hatch, while her husband sat at the other end of the long table. In due course the plates from the starter were cleared away. Polite diplomatic conversation continued as they waited for the main course. Some of the guests began to giggle. Mary wondered if there was some joke that she had missed. People seemed to be looking at something behind her. She turned around to see Robert climbing through the hatch, a large serving dish balanced precariously in his free hand. Mary wanted everything to come through the hatch and so it did. Place milk, cream, sugar and coffee in a saucepan and bring to the boil, then remove from the heat. Meanwhile place gelatine and water in a small bowl then zap in the microwave briefly to dissolve. Mix gelatine mixture into coffee mixture then divide among 6 small ramekins, coffee cups or glasses. Chill for several hours or overnight. For the Hazelnut Chews, preheat oven to 180°C. With electric beaters whip egg whites and salt until soft peaks, then gradually beat in the sugar until you have a thick, glossy meringue. Beat in the cocoa then fold in the chopped nuts. Line a biscuit tray with baking paper and place tablespoons of mixture onto the tray with a little space for spreading, though they won’t spread much. 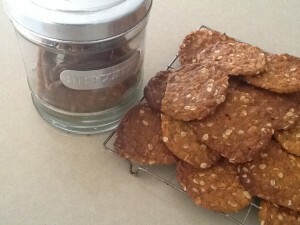 Top each biscuit with a whole hazelnut then bake for 15-20 mins. Mine were done in 15 mins and to be chewy you don’t want them overcooked. Makes about 15. Serve panna cottas sprinkled with a little grated chocolate, with the hazelnut chews and pouring cream in a jug. 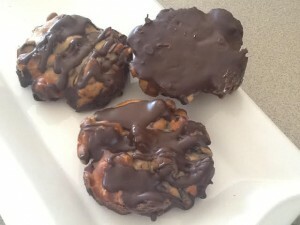 Florentines are a delicious treat to serve with coffee after dinner. Actually they’re delicious any time of day. I swear they talk to me from the tin, sending out “Eat me” messages. They’re quite big, so if it makes you feel better cut them in half, or make smaller ones. But you’ve seen Florentines in cake shops – they’re always big! Use any combination of dried fruit and nuts you have on hand. I used some dried sour cherries from Costco and craisins (dried cranberries). I left out the candied peel because I’m the only one in our family who likes it. Woolworths sell non-stick egg rings in two packs for about two dollars, so I bought five packs. I could have made the Florentines slightly thinner and got 12 from the recipe, but I had only bought 10 egg rings, so that was that! If preferred make them free-form by placing heaped tablespoonsful onto the paper – they will spread as they cook. Preheat oven to 180°C. Line a baking tray with non-stick paper and arrange the egg rings on top. In a medium sized saucepan heat cream, sugar and honey till boiling. Remove from the heat and add fruit, nuts and flour. Cool for a few minutes so it thickens up. Divide among the rings spreading evenly then bake for 10-15 mins or until light caramel coloured. Don’t overcook as the fruit easily burns. Leave to cool on the tray. Melt chocolate and oil or Copha in microwave or in a bowl over boiling water. Dip each Florentine into chocolate on the flat side, shake off excess then cool on non-stick paper, chocolate side up. If you’re in a hurry stick them in the fridge or freezer. And if you have any chocolate left, drizzle a bit on the bumpy side, but let the chocolate set on the first side before you do this. They actually look better on the drizzly/bumpy side. 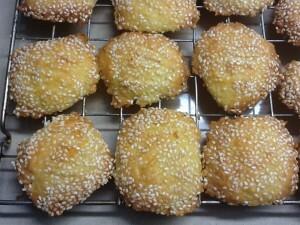 My Thai friend Pom makes these delicious crunchy biscuits. She gave me some as a gift recently, but they were so good I ate them all as I was driving home, so Matthew didn’t get any. I asked her for the recipe and decided to double the quantities because I knew that 16 biscuits wouldn’t last long. They’re like muesli in a biscuit – healthy, satisfying, good for lunch boxes or to go with a cuppa. An Australian cup measure is 250ml or a quarter of a litre. Preheat oven to 180ºC. Place cornflakes in food processor and process briefly to break them up a bit, but not much. If you need to chop the chocolate do it now and add it to the cornflakes. Place sugar or honey and butter in food processor and mix until smooth and creamy. Add eggs and mix well, then flour and vanilla. When smooth, scrape into the bowl with the cornflakes, add remaining ingredients and mix well. Line two or three baking trays with baking paper. Form mixture into 3cm balls and arrange on trays with spaces in between. Bake for 12-15 minutes or until golden – don’t overcook or they will be dry. Cool then store in a tin with a lid. This recipe first appeared in the Australian Women’s Weekly Big Book of Beautiful Biscuits when it was published in 1982. I’ve been making it ever since and it’s always popular. 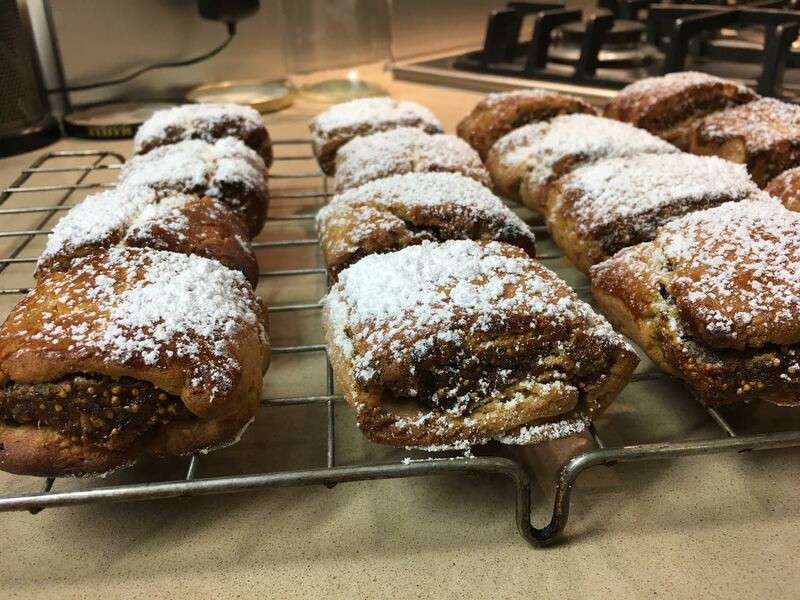 The original recipe uses 2 cups fruit mince (mincemeat) but I use a cup of dried fruit and a cup of jam instead. It’s great for using up all those bits of jam and marmalade at the bottom of jars – something my family say I’m famous for. It’s always a great achievement when you can find things in the fridge which need using up and turn them into something finger lickin’ good. When I returned to take the photo someone, who shall remain nameless and blamed the dog, had already eaten a piece. Preheat oven to 180°C. Process butter and sugar in food processor until creamy. Add sifted flour and mix until you have crumbs which are starting to stick together. Press mixture into a greased Swiss Roll tin or slice tin (mine is 35x25cm) lined with baking paper. It doesn’t have to look very smooth but it does need to be evenly spread to cover the base. Bake for 10 mins or until golden. Process eggs, sugar and vanilla in food processor. Add coconut, jam and fruit and process just enough to mix. Spread topping over the cooked base, bake for 25-30 mins or until firm and golden brown. 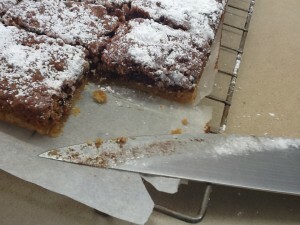 Cool, dust with sifted icing sugar and cut into squares. Variation: Frangipane Bars: make the base as above. When cooked, spread with about a cup or so of raspberry jam or lemon curd. For the filling mix 125g butter, softened, with 1 cup caster sugar in food processor until light and fluffy. Add 4 eggs, ¼ cup plain flour, 3 cups almond meal (or another ground nut) and a tsp of vanilla or almond essence. Spread evenly over the base, sprinkle with flaked almonds and bake for 25-30 mins or until firm and golden brown. On the 25th of April Australians and New Zealanders remember those who have lost their lives in military conflict. The date of Anzac day marks the anniversary of the landing in Gallipoli (Turkey) during the First World War, when many lives were lost. The acronym Anzac stands for the Australian and New Zealand Army Corps. Dawn services are held on this day in many countries including in France and Turkey. 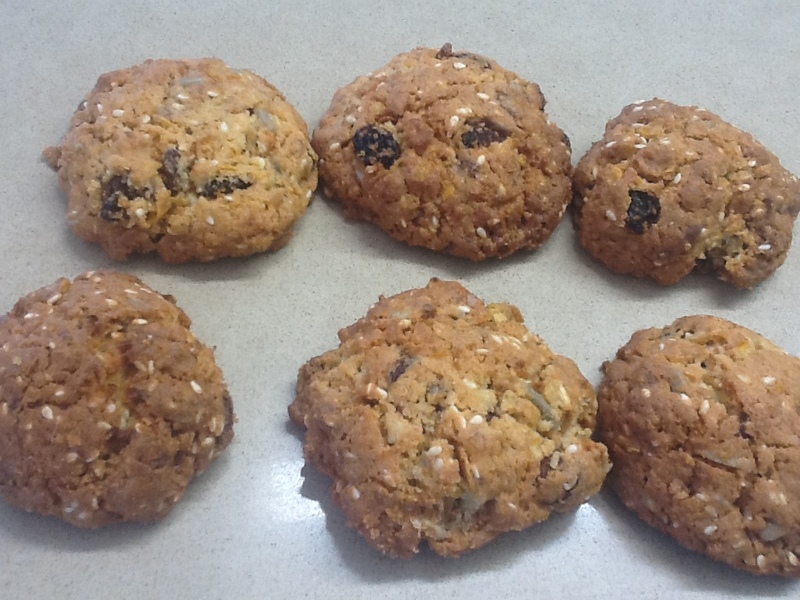 Anzac biscuits were apparently sent by wives to soldiers abroad because they kept well during naval transportation. Nowadays they are made commercially, but many people make their own. There are some variations in the recipes so here is mine. Preheat oven to 170°C. In a large bowl mix oats, flour, sugar and coconut. Place butter and golden syrup in a small saucepan and stir over gentle heat until melted. Mix soda with boiling water and add to the butter mixture, then mix into the dry ingredients. Place balls of one tablespoonful of mixture on lightly greased oven trays, or trays lined with non-stick baking paper – 12 per sheet, not too close together as they will spread. Bake for about 20 minutes, or until a nice honey-brown colour. If you prefer them more chewy and less crunchy, remove from the oven when they are lighter in colour than those shown in the photo. If on tins without paper, loosen while still warm, then cool on the trays. Store in an airtight tin. Note: unless you live in Australia, New Zealand or the UK you may have difficulty finding golden syrup. There are some online sites which sell British ingredients. I have tried substituting honey but it’s not the same. These delicious biscuits are family favourites to serve with drinks. They’re a traditional Aussie recipe and were made by all the ladies of a certain age – my mother in law, her sister and my dear friend Joan Tyrrel who passed away last year. While the recipe says to use cheddar, you can use any hard cheeses, including a mixture of leftover bits and pieces! At their best when fresh, they will keep in a tin with a lid for up to a week, if they last that long. Preheat oven to 180C. Place flour and butter in food processor and process until fine crumbs. If liked add some English mustard powder or cayenne pepper at this stage. Add grated cheddar and continue to process until mixture forms a ball. Tip out then pinch off pieces the size of a large walnut and roll into balls. Roll balls in sesame seeds to coat them all over, then arrange on baking trays lined with baking paper. Press each biscuit lightly with a fork and leave a space between each one as they will spread while cooking. On a hot day it’s a good idea to refrigerate the biscuits for about half an hour before cooking. Bake for about 15 minutes or until golden. Cool on cake racks.